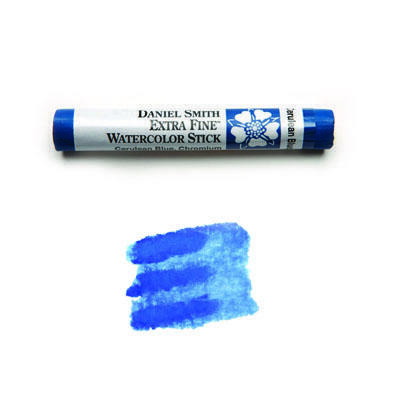 Beautiful on its own, and especially so when mixed with a transparent pigment, this sky blue inorganic pigment is granular and medium-light in value. Highly permanent and extremely low-staining, Cerulean Blue creates exciting granulation and settling washes. A drop of Cerulean Blue into a damp wash such as Burnt Sienna creates a halo effect around the more dense Cerulean. This is especially effective when Quinacridone Gold or Quinacridone Burnt Orange are used in the moist underpainting. This technique is great for rendering lichen and Spanish Moss. Add Buff Titanium, Undersea Green and touches of Lunar Black – each a DANIEL SMITH exclusive – and the creative fun truly begins! For a misty landscape or that dusky quality on eggplant, grapes and plums, think Cerulean as a mixer.